SNMP monitoring and control is available for Crystal Vision's remote-enabled boards – giving Crystal Vision products excellent integration with station management software. Using SNMP requires a Vision 3 or Indigo 'AE' or 'SE' Crystal Vision frame, the activated front panel SNMP agent and appropriate MIBs. SNMP is included for free in the Vision 3 frame. For the Indigo frame system, one SNMP licence needs to be purchased for each Indigo frame – making it a cost-effective way to get SNMP monitoring and control for any boards within that frame. SNMP (or Simple Network Management Protocol) is an Internet-standard protocol for managing devices on IP networks. One or more administrative computers (managers) have the task of managing a group of devices on a computer network, with each managed system executing a software component called an agent which reports information via SNMP to the manager. Crystal Vision's SNMP can work with any SNMP manager, while the SNMP protocol in the Crystal Vision frames supports versions 1, 2 and 3 of SNMP. The Vision 3 frame includes SNMP for free. The Indigo AE and SE frames come with a pre-installed SNMP agent. To activate the SNMP manager a licence needs to be installed, which is obtained from Crystal Vision's customer support and downloaded to the Indigo frame using the board update tool. 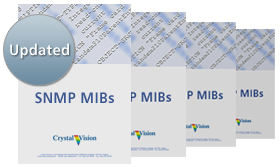 Both SNMP monitoring and control are available for Crystal Vision products. With SNMP monitoring, the agent can either report the status or generate traps on a status change of any board in the frame. With SNMP control, the manager can read and change the value of control settings on any board in the frame. SNMP traps can be used to trigger alarms. The SNMP traps are very comprehensive, with traps able to be sent on both status changes and control value changes. The user can configure the traps to be SNMP version 1 or 2, as required by their system, and can even send different versions of the trap to different destinations. 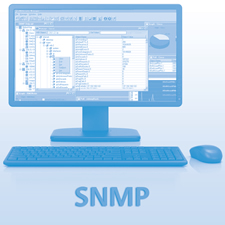 SNMP trap filtering allows the user to configure the frame to send only the traps they want – ideal for limiting the amount of traffic in big systems and for simplifying the design and set-up of the trap receiver. 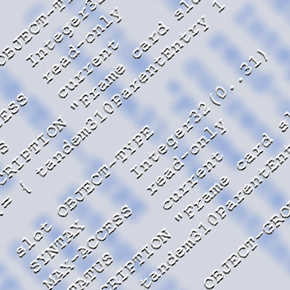 Based on the contents of an XML file, the filtering can be set at various levels, from the entire frame down to individual traps. The SNMP information returned by the frame includes the board software version – useful for checking that you have the correct software in all your boards. Each Crystal Vision remote-enabled board has its own MIB (translation table) for both monitoring and control. Available in one zip file, the latest MIBs build is 15712 (released 19th December 2017) which added updated MIBs for the Safire 3, Safire 3 Xpress and LKEY 3 keyers. Also available is a helpful guide to the SNMP MIBs, which explains which file is used for which product. The MIBs zip file and SNMP MIBs guide are both available for download from the Registered Area on this website. Log into the Registered Area to download the files – to do so you will need your Registered Area username and password. Alternatively request a Registered Area password now.